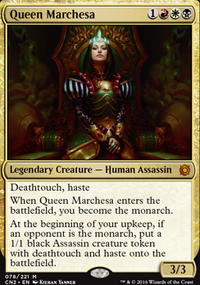 When Marchesa's Decree enters the battlefield, you become the monarch. 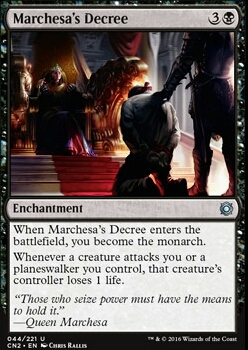 Marchesa's Decree was more like an example because it also ignites the "monarch" mechanic and i don't know if you want to go that way. Other two things i wanted to suggest: 1) i fear you don't run enough lands. 2) Not enough removals. Mass removals are important because i get you don't want your commander to die but in some situation you have to deal with bigger threats. Nice deck, on the Commander's Quarter YouTube channel there's a deck tech you may want to check out for suggestions. I have only a couple myself: 1) add some pillow fort cards like Crawlspace or Marchesa's Decree . It's true that your commander can't attack you but they may want to do it with their other creatures. 2) Cruel Entertainment is fun but very easy to escape because the two opponents you chose may make some kind of pact not to mess things up against each other. This means you paid 6 mana and they are going to attack you if they are smart enough. Coward_Token You know what, I actually removed Keeper of Keys from my physical decklist, I should update this but I've been trying to solidify what I want to change. I think that Marchesa's Decree is a great idea. I personally am going to be getting a Queen Marchesa deck soon so I don't know if I'll get it for this deck to avoid overlap, but it does do its job pretty well. On the other hand, it does mean that players draw cards from Ludevic from attacking you so it could actually cause you to take more damage than average. I'll try to update the list soon! I do agree that Keeper of Keys is too slow though, and I've been trying to make the deck more spellslinger-y with Niv-Mizzet, Parun and Living Lore , and some X mass-damage spells. Your version of the deck looks fun! but here are a few suggestions. . .
1: the hunted cycle is really fun, but there are much better cards that do the same thing, like Genesis Chamber , Sylvan Offering , Captive Audience Akroan Horse , and many more. 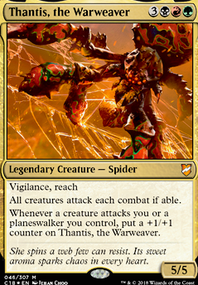 also [] synergieses SO WELL with Thantis, it's hilarious. 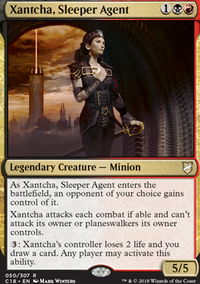 2: if you want to give your opponents tokens, you gotta tickle them a little when they come in, and with cards like Essence Warden , Blood Seeker , Rampaging Ferocidon , and Xantcha, Sleeper Agent , they're bound to say "thanks, you shouldn't have. . . really"! 3: If you want the TRUEST pain of all, you simply MUST try making it hurt more to attack you! the trio of pain Hissing Miasma , Blood Reckoning , and Marchesa's Decree will all but guarantee pain for the opponents! 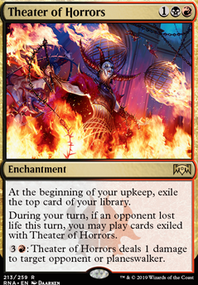 but if you want the creatures to hurt, try cards like Caltrops and Circle of Flame to lay on the pain! 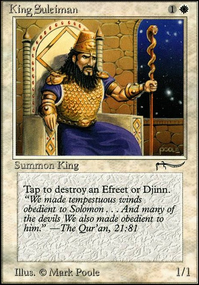 In conclusion, your deck is sweet, I took some of the cards in here for my own deck, and I can't wait to see how your deck changes and adapts! Upon going through this list, I immediately pulled up a list of Conspiracy 2 commons and uncommons and was not dissapointed. Try things like Death Wind for mana sinks and removal. Marchesa's Decree and Deadly Designs might be out of your price range, but they're both worth considering. The same is true for untap engines Onyx Talisman and Jandor's Saddlebags . You might want to replace some of the direct damage and lifedrain. Looks great, can't wait to play against it! Marchesa's Decree Kazuul, Tyrant of the Cliffs Skyline Despot Windborn Muse Baird, Steward of Argive Knights of the Black Rose Ankle Shanker Brutal Hordechief Adriana, Captain of the Guard Comeuppance Crawlspace A few extra pillow fort cards, some to help get you monarchy and benefit you while you are the monarch, and some to help your tokens become more powerful.